Jennifer Lawrence is Blazing Hot in "Catching Fire"
The Hunger Games: Catching Fire (2013). In what many call the Golden Age of Hollywood, the years of "Gone With The Wind," "Citizen Kane," "42nd Street" and too many classic films to list, the film industry's bread and butter was not the high-profile technicolor films of the auteurs like Orson Welles and Ernst Lubitsch. Instead, it was the lowly serial, exemplified by the "Flash Gordon" films. Even those, however, were the classy alternative to the real workhorses of the time, such as Buster Crabbe's "Billy the Kid" and "Billy Carson" efforts. Katniss and Peeta, together again in "The Hunger Games: Catching Fire." Those films are forgotten now - have you ever heard anyone mention the Billy Carson film "Rustler's Hideout"? Or ever heard that there actually was a Billy Carson serial? - but they met the public's desire for continuity of character and theme. The serials fell completely out of favor by the dawn of the 1960s, most likely because episodic television satisfied that craving. With films becoming "events" to stay above the weekly riff-raff on the tube, sequels were rare (if any film ever truly deserved a sequel, it was 1959's "North By Northwest"), and serials all but extinct. 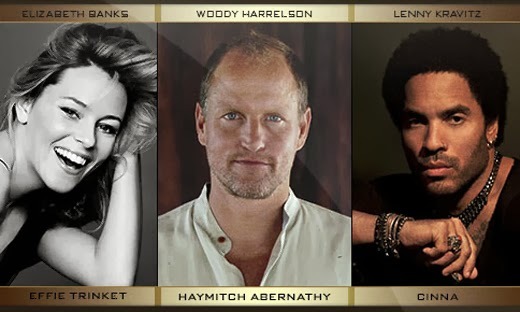 Woody Harrelson, Lenny Kravitz and Elizabeth Banks lead a fine supporting cast in "The Hunger Games: Catching Fire." Well, serials are making a comeback. The recent "Twilight" books blossomed into five feature-length films that proved astoundingly popular, while "Harry Potter" generated even more. Truth be told, both of those series could still be running were it not for the fact that the source material finally petered out and, in the case of "Potter," the stars finally started showing signs of ageing out of their characters. 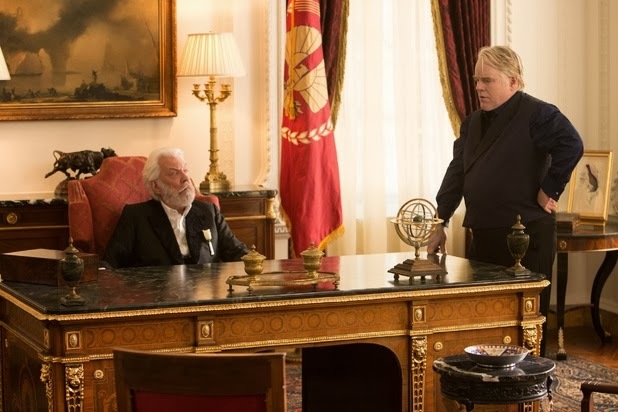 Donald Sutherland and Philip Seymour Hoffman in "The Hunger Games: Catching Fire." So, with both the "Potter" and "Twilight" gold mines played out, the lonely eyes of the suburban film warrior cast about for the next Big Thing. Many studios tried and failed to fill this niche - Disney no doubt had big plans for the failed "John Carter" that turned out to be clouds in its coffee - thus proving that it is no simple thing to turn audiences into frenzied fanatics drooling at the latest release featuring their favorite characters. Beware the stormtroopers in "The Hunger Games: Catching Fire." "The Hunger Games," though, managed to pull it off. Upon its release in 2012, "The Hunger Games" pulled in audiences by the busload, set box office records (biggest opening outside of the peak summer and holiday seasons), and won all sorts of minor awards (how many films win awards at the CMT Music Awards?). This being the rebirth of the age of the serial, with a big yawning vacuum opening up with the end of "Potter" and "Twilight," the time was right for unassuming star Jennifer Lawrence to step up and blaze the way for more outrageous studio profits. 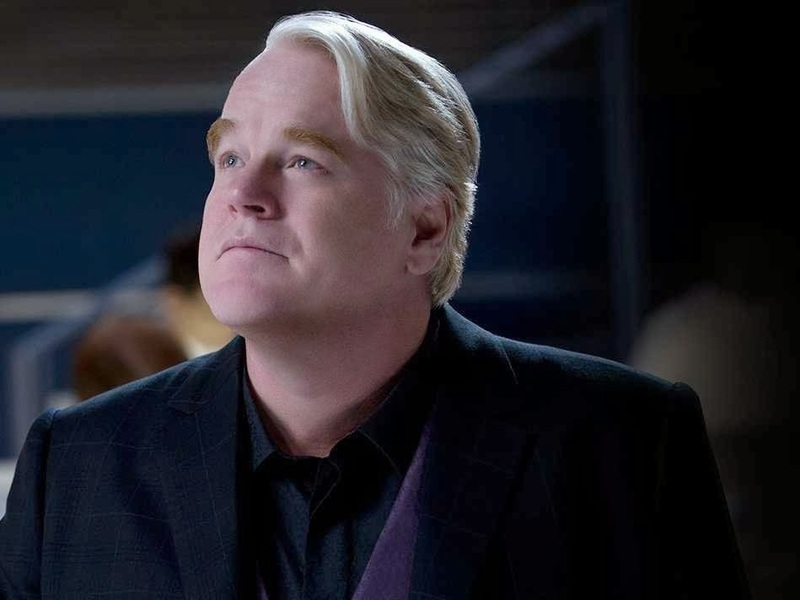 Philip Seymour Hoffman realizes a dream: a role in a big-budget blockbuster in "The Hunger Games: Catching Fire." "The Hunger Games: Catching Fire" (2013) is based on the 2009 novel "Catching Fire" by American novelist Suzanne Collins, the sequel to her original 2008 "The Hunger Games." 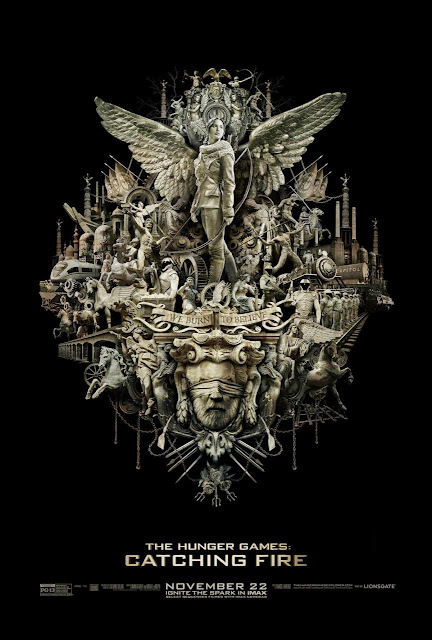 Directed by Francis Lawrence (no relation, apparently), a music video director who graduated to the Hollywood big leagues with Will Smith's "I Am Legend," and with a screenplay by Simon Beaufoy and Michael deBruyn, "Catching Fire" has the same stars and setting as the original. We catch up with the characters after their upset victory in one of the brutal life-or-death competitions that characterize the "Hunger Games" world. There is a bit too much standing around at times in "The Hunger Games: Catching Fire." Katniss Everdeen and Peeta Mellark have returned home after their triumph, but then receive an unexpected visit from President Coriolanus Snow. He is worried about the way they vowed to commit suicide due to the Games' requirement that only one of them could survive, which generated unrest in the districts (obviously, they both survived). To get back in the President's good graces, Katniss and Peeta must pretend that their reason for threatening suicide was not based on politics, but only on their supposed deep and undying love for each other à la Romeo and Juliet. Haymitch Abernathy, Katniss' mentor, emphasizes that they can only be safe if they maintain the fiction forever. Snow makes painfully clear that Katniss' and Peeta's families will be at risk if they fail to comply. The CGI is done competently but not spectacularly in "The Hunger Games: Catching Fire." Embarking upon a victory tour, the pair quickly learn why Snow is concerned. A man in the District of Katniss' ally Rue, who died in the Games, inspires a spontaneous public protest. That turns out to not be a very good idea when he is immediately killed by government security forces, called Peacekeepers. To quell the incipient uprising, Katniss orchestrates a very public engagement between herself and Peeta. Government forces also crack down, and Katniss' friend Gale Hawthorne is publicly whipped after attacking the Peacekeepers' leader, Romulus Thread. 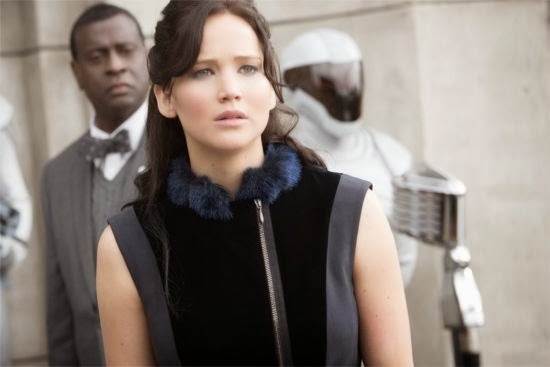 The Victory Tour is not what it seems in "The Hunger Games: Catching Fire." Snow also moves to mollify the mob, declaring that there will be a "Quarter Quell." This is a competition like the annual Hunger Games, but with all participants composed of previous victors of the Games - sort of a "Celebrity All-Star Survivor." Katniss and Haymitch wind up being selected, Peeta volunteering to take Haymitch's place. 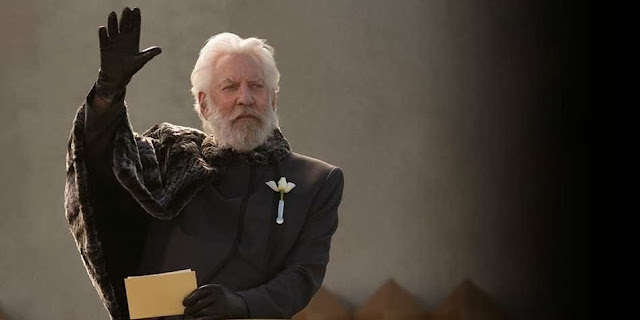 Old pro Donald Sutherland gives a wave in "The Hunger Games: Catching Fire." 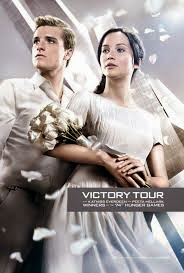 The Games proceed, and Katniss and Peeta make allies who are quickly killed off for one reason or another. 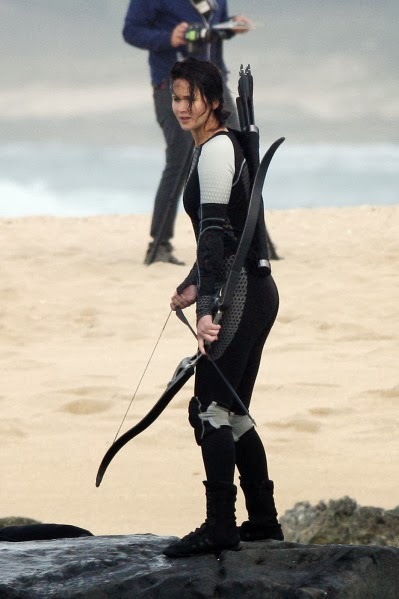 Another competitor, Johanna Mason, injures Katniss, but Katniss recovers and, using information gleaned from other competitors, shoots an arrow that winds up destroying the entire arena. Katniss awakens on a plane without Peeta, and learns to her horror that her home District has been destroyed. 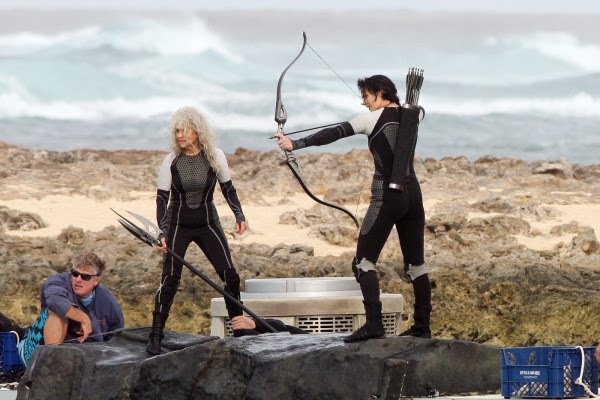 Jennifer Lawrence fills out a wet suit nicely in "The Hunger Games: Catching Fire." Lionsgate was able to get all of the original stars of "The Hunger Games" to return, most with sizeable raises, but there is no question that Jennifer Lawrence dominates. She is a personable and versatile actress well suited to playing action roles. Josh Hutcherson plays Peeta, Liam Hemsworth is Gale Hawthorne, and Woody Harrelson is the genial Haymitch Abernathy. Donald Sutherland deserves special mention for his menacing portrayal of President Snow, while Lenny Kravitz plays fellow competitor Cinna and Philip Seymour Hoffman does his usual fine job as Plutarch Heavensbee, the head gameskeeper who has a secret. Katniss uses her bow and arrow again in "The Hunger Games: Catching Fire." The scenery is another star of "The Hunger Games: Catching Fire." Filming was done on location in Hawaii and Atlanta, Georgia, and reports were that it was a grueling time for all concerned. While the first film had some shaky camerawork and other hallmarks of an unexpected success, "Catching Fire" has a much more polished and professional feel. James Newton Howard returned as the composer, with Coldplay contributing the popular song "Atlas." Other music industry veterans contributing to the project were Christina Aguilera, Patti Smith and Of Monsters and Men. There are some odd scenes in "The Hunger Games: Catching Fire." There is no use quibbling about the unlikelihood of any of the events in a film such as "The Hunger Games: Catching Fire" being plausible or even possible. Just like "Twilight," in the long run "Catching Fire" is likely to be little noted and not long remembered. It is what it is, a crowd-pleaser. It is enough to say that "The Hunger Games: Catching Fire" is a rousing action/adventure/science fiction potboiler that satisfies the modern need for a strong female heroine who (inevitably) defies convention. Lawrence does a fine job in the director's chair, wisely dwelling more upon the franchise's philosophy and politics rather than the actual Games - been there, done that. Jennifer Lawrence showing her quirky fashion sense at the premiere for "The Hunger Games: Catching Fire." At heart, "The Hunger Games: Catching Fire" is a tale of a latter-day Spartacus waiting for her moment to lead the slaves to freedom. For fans of this genre, the big question is not whether Katniss ultimately succeeds, because that is a foregone conclusion: the bottom line is what price she has to pay to get there, and who makes it with her. 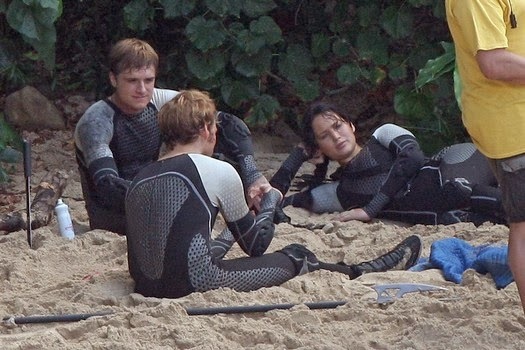 The cast on location in Hawaii for "The Hunger Games: Catching Fire." The engaging Jennifer Lawrence has lifted the dormant "Top Female Idol of Female Reviewers" mantle from the bony shoulders of Kristen Stewart. Nothing makes an actress popular like success, and "The Hunger Games" series is about as sure-fire a winner as you will ever find in the film industry. Lawrence gets to be a bit more glammed-up this time around, going for a more girly look which contrasts nicely with her usual athletic posing. Eventually, Lawrence's day will pass - yes, it will happen, trust me, sic transit gloria mundo and all that - but, for now, she stands astride Hollywood like a female Colossus. To capitalize on her appeal, Lionsgate will pull a "Twilight" and split the third and concluding "Hunger Games" novel into two feature films in order to milk the cow bone dry. Only then will the search begin in earnest for the next cash cow. Jennifer Lawrence and friends promoting "The Hunger Games: Catching Fire." 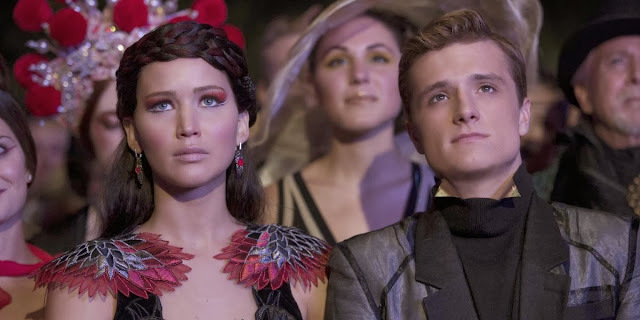 "The Hunger Games: Catching Fire" is long, overblown, dull and wordy in spots. It follows the standard genre conventions of others sacrificing themselves for the heroes and giving them the means to succeed without getting any credit themselves - in fact, they invariably die, the modern equivalent of Red Shirts. The film also borrows a bit too noticeably from other science fiction classics, with the government troops looking uncannily like "Star Wars" Stormtroopers. Anyone succumbing to the hype and actually comparing "The Hunger Games: Catching Fire" to a "Star Wars" film... well, everyone is entitled to their opinion. For all that, "The Hunger Games: Catching Fire" is a definite guilty pleasure. 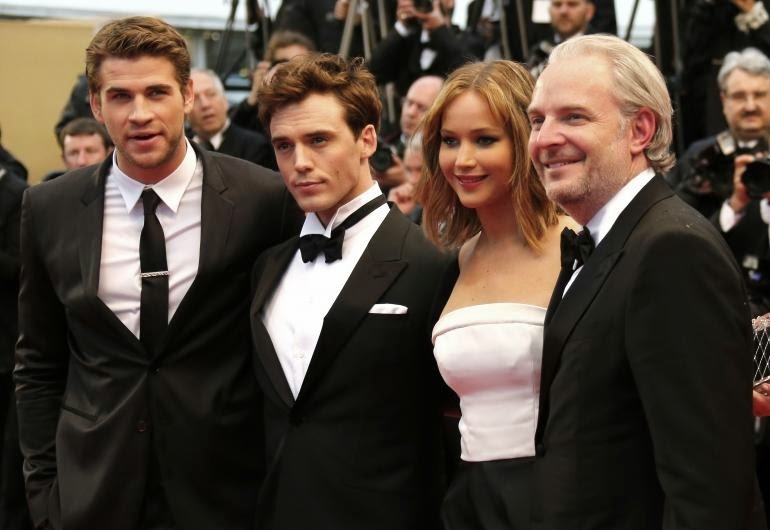 Just like its predecessor, it is "catching fire" at the box office, grossing the sixth highest opening weekend of all time. It is a must-see simply to be conversant with today's film vernacular. The trailers are below. 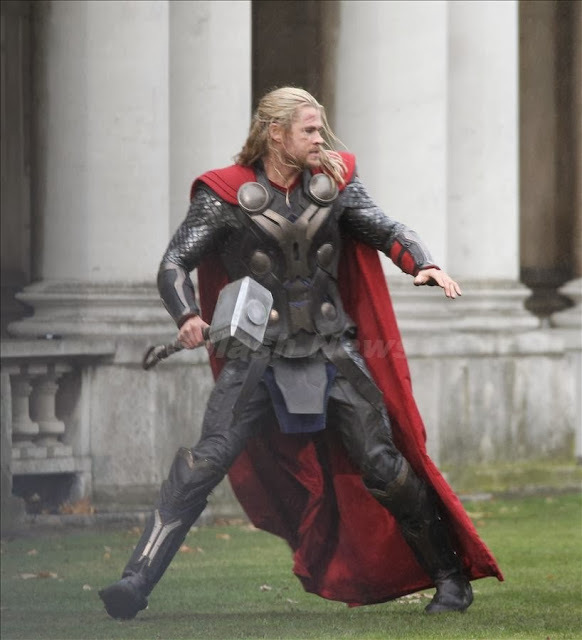 There are few surprises in "Thor: The Dark World" (2013). Basically, the same crew is back from "Thor" (2011). If you enjoyed the first "Thor" film, you shouldn't be disappointed by this sequel despite a change in directors. Chris Hemsworth hauls a mighty hammer in "Thor: The Dark World." "Thor: The Dark World" is directed by Alan Taylor, replacing Kenneth Branagh. 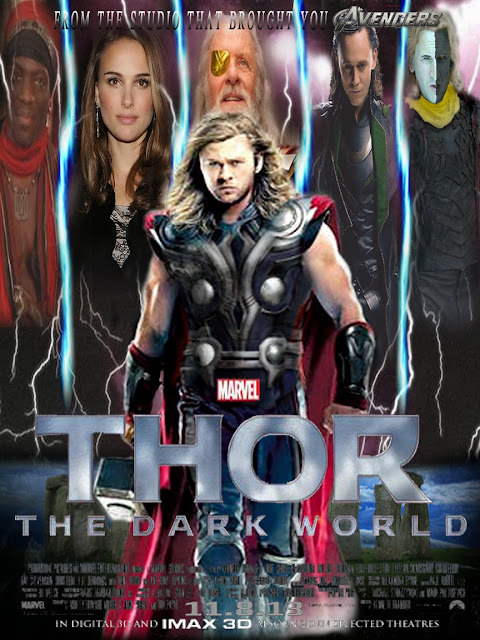 "Thor: The Dark World" stars Chris Hemsworth as Thor, Natalie Portman as Jane Foster, Tom Hiddleston as Loki, Anthony Hopkins as Odin, Christopher Eccleston as Malekith and Rene Russo as Frigga. I don't know about you, but any film with a female character named "Frigga" is worth checking out. 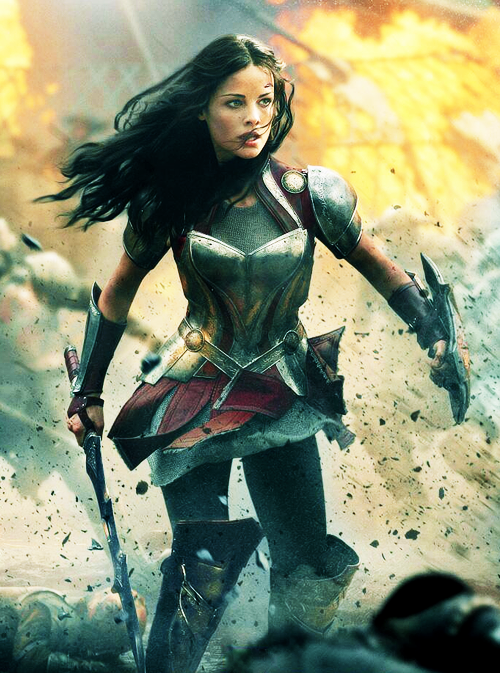 A true fighting female in "Thor: The Dark World." Very loosely based on the ancient Norse legends, "Thor: The Dark World" is a typical Marvel superhero action/adventure movie. You know what you're getting - lots of action, wild special effects (CGI coming out of the wazoo), some provocative posing by choice females, occasional banter verging on humor, and lots of things with weird names like the "Asgardian waterfalls" and so forth and so on. Oh, and don't forget the action figures. 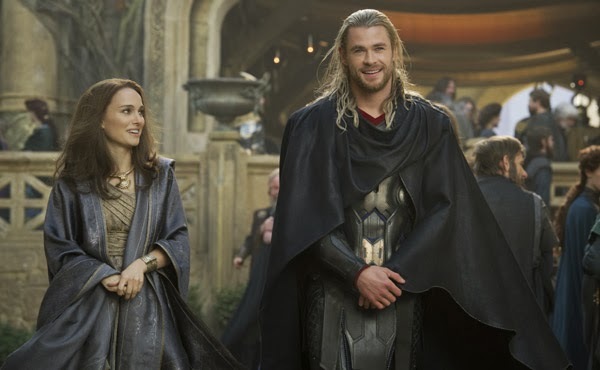 Natalie Portman and Chris Hemsworth in "Thor: The Dark World.". Let's face it, most people go to Thor films and root for Loki. That's just how it is. Fortunately, Tom Hiddleston gives a standout performance as Loki that covers up some of the other lackluster acting. Which is not to say that star Chris Hemsworth gives anything less than a stellar performance, but when it comes to wisecracking asides, he's no Harrison Ford. 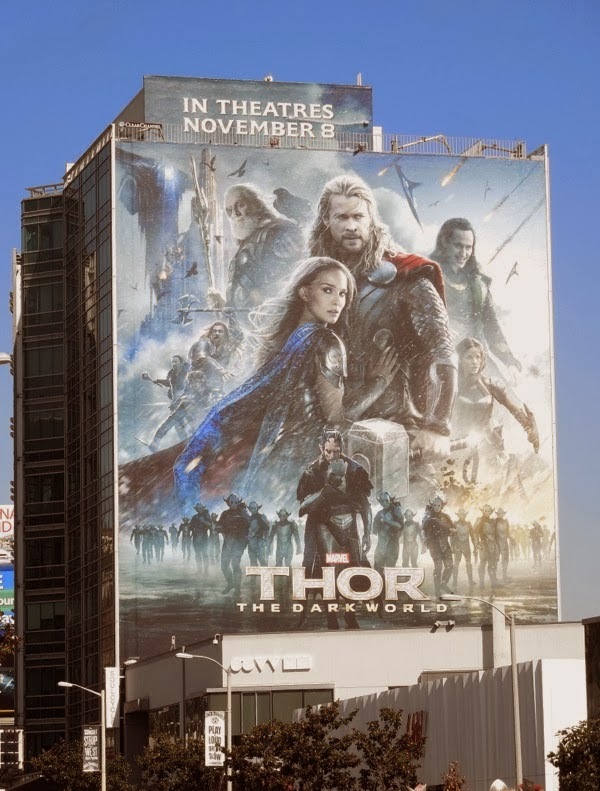 This poster for "Thor: The Dark World" is right across from Grauman's Chinese Theater in LA, I believe. "Thor: The Dark World" fits into the whole Marvel universe which includes the "Iron Man" and "Avengers" films, and is right in line with those films, though one can be picky and say that the Thor films are nowhere near as, shall we say, serious as "The Avengers." There is a plot about "dark elves" and a plot to take over the universe - apparently just taking over the world is so, like last century - and "Thor: The Dark World" melds the present with superheros in typical bravura Marvel fashion. In terms of action and adventure, you should not be disappointed by "Thor: The Dark World." 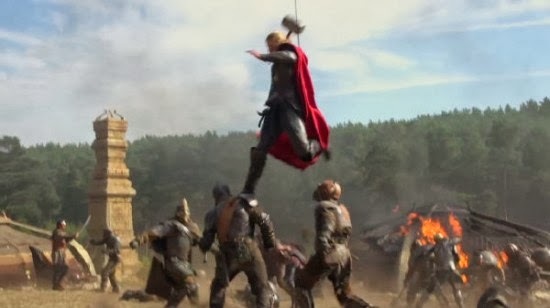 This is how Thor accomplishes his mighty leaps in "Thor: The Dark World." Below, actress Emma Caulfield ("Buffy the Vampire Slayer," "Beverly Hills 90210," "When Darkness Falls") reviews the Marvel superhero movie "Thor: The Dark World" (2013).